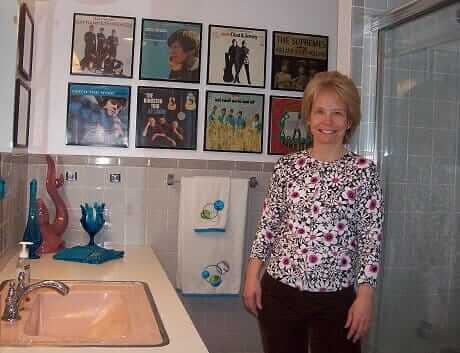 Glamorlux aka Nancy is a new reader, who sent these darling photos of her 1959 pink hall bathroom. She didn’t have to be on the blog too long to know how to get my attention! Just wanted to introduce myself. My husband and I are restoring a 1959 split-level house back to its original mid-century glory. 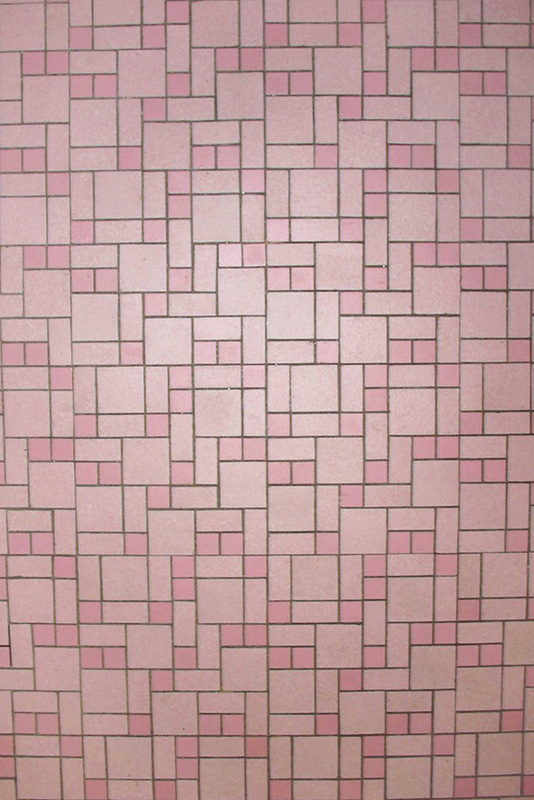 Luckily, most of the original fixtures and features were never updated – including a pink bathroom! We are gathering the materials to re-do our kitchen. It has the original Textolite “golden beige twilight” countertops, however, they are worn and don’t have the metal banding, which we like the look of. So, we just ordered the Formica Aqua Boomerang laminate through The Home Depot (where a 3′ x 10′ piece is only $56!). Thanks to you, we also ordered the ss metal banding from Dave Sanders. 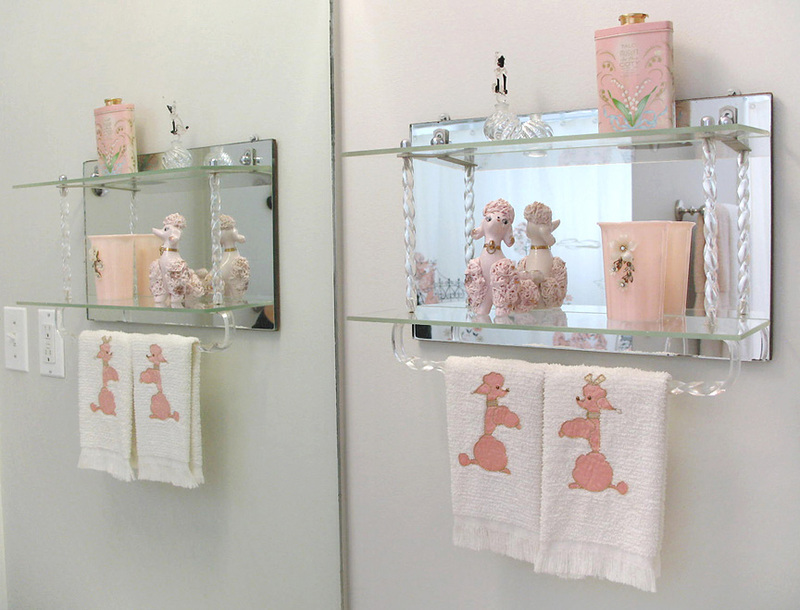 …Our pink hall bathroom is part of what sold us on our 1959 split-level home. It is sort of tame as vintage pink bathrooms go, but I guess they were toning them down by the late 50’s. The toilet, tub, salt and pepper tile, mosaic floor, light fixture, casement window and venetian blind are original. 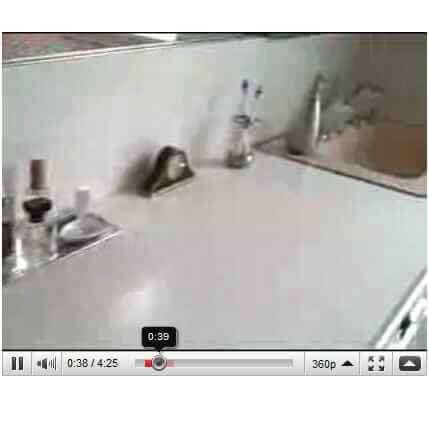 We believe the sink and vanity were replaced (probably in the 1980’s), but at least they didn’t put in an oak cabinet! It had the original Hall-Mack bathroom accessories, which we transferred to the master bath, and replaced with lucite and chrome towel bars. I painted the mint green walls a light grey, and added a poodle theme. Most of the decor was purchased off of eBay. Hope you like it! Thanks for your guidance so far! Thank you, Nancy! It is so interesting to hear from readers all over the country. Midcentury modern was not just a high falutin’ east and west coast designer phenom. Wonderful mid mod homes are are everywhere: Virginia, Texas, Iowa, Wisconsin, Missouri, Maine, Illinois, Vermont, Ohio, California, New York. Oh yeah – Kansas, Florida, Kentucky, Indiana, Washington, Oregon. Construction exploded in America in 1946 – Retro renovators are everywhere, man, just like that in Johnny Cash song. Save the Pink Bathrooms commemorative video! We have a flooring in both bathrooms that look like this, one in blue and one in green. It looks like tile but is a laminate I think. Our house was built in 1959. Do you know if it would contain asbestos? Nancy — You need to get yourself your own properly licensed professional to check what is in the materials in your house. 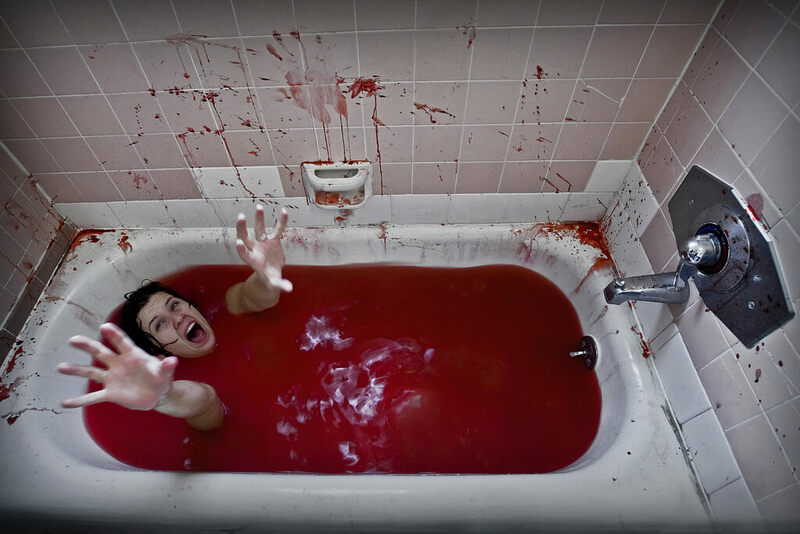 I have the same bathroom floor. Does anyone know where you can get additional tiles like this? Alas, World of Tile now gone. I don’t know where else to send you. See our research on this topic in Bathroom Help / Tile. I keep going back to those pink poodles, because – well, it’s like a little gift to my heart, you see! 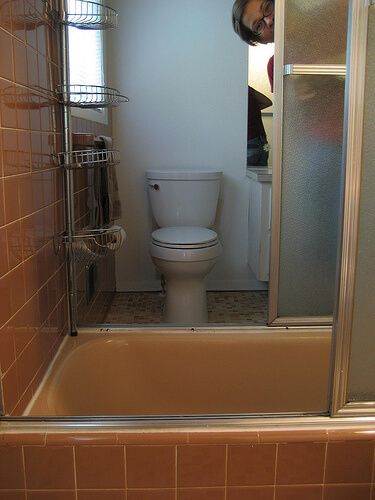 Growing up in the 60s, into the 70s, our main bathroom had wallpaper with pink and black poodles at a vanity … I literally cried and begged when my mother insisted it had to come down for something “more modern” – just like I did when she banished the comfortable, upholstered, art deco dinette set, for those nasty wooden captain’s chairs and table! Anyway … love, love, love this! and Glamorlux Nancy, please start a blog!